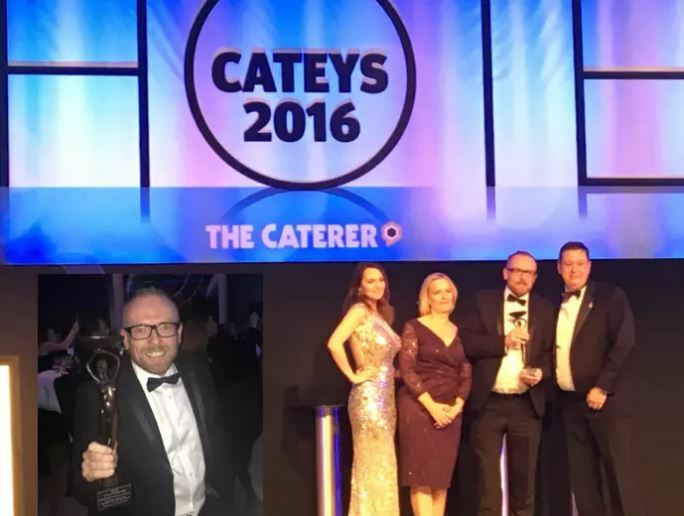 @StokePark’s Chris Wheeler crowned Hotel Chef of the Year at the Hotel Cateys 2016! Stoke Park, the luxury 5 AA Red Star Country Club, Spa and Hotel, is delighted to announce its Executive Chef, Chris Wheeler, has been awarded the Hotel Chef of the Year ( over 250 covers) award at the prestigious Hotel Cateys 2016! Considered the Oscars of the Hotel Industry, the Hotel Cateys were held on Friday 25thNovember at a glittering ceremony at the Park Plaza Westminster Bridge, hosted by actress and impressionist, Debra Stephenson. The Caterer’s, Hotel Cateys are now in their tenth year, and each year’s awards have been bigger and better than the last. This wonderful award crowns a magnificent year for Chris, who in October also won the ‘Chef of the Year’ award at the Berkshire and Buckinghamshire Life Food and Drink Awards 2016and made his debut on BBC 2’s Great British Menu.